A lot has been said about the Interceptor 650. So Oli and Matt try living with one in the UK. What’s it like? Thanks to GV Bikes in Taunton and MotoGB, importer, for the loan bikes. This is a brand-new motorcycle. It’s a 650cc twin, looks pretty good and is easy to ride – and it costs £5500. On the road. With three year’s warranty and three year’s breakdown cover. So, is there a catch? The other day I saw an ad for a CB350 twin from 1975, describing it as a middleweight. It’s a mark of how our expectations have changed that Royal Enfield’s new 650cc parallel twin is now counted as one of those middleweights. I went for the Interceptor rather than the GT, as I personally think it’s the better looking of the twins (other opinions are available). I’m also getting a bit stiff in the joints and increasingly wide around the waistband, so a café racer crouch isn’t for me. First impressions being the clean lines and all the gubbins tucked away, no mass of tubes and pipes many Japanese retros suffer from. The switchgear is simple and straightforward. The indicator switch is flip on, push off, just like those on my old Yamaha XS650 twin. There’s a kill switch, a starter button, a horn and a dipswitch, and that’s it. 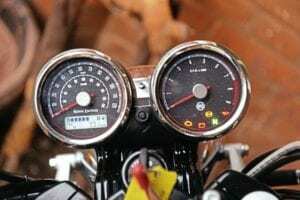 There are two clocks that are neat, with a mere handful of warning lights in the speedo and a digital fuel gauge – something that puts me off the Triumph Street Twin is the complicated single clock look. 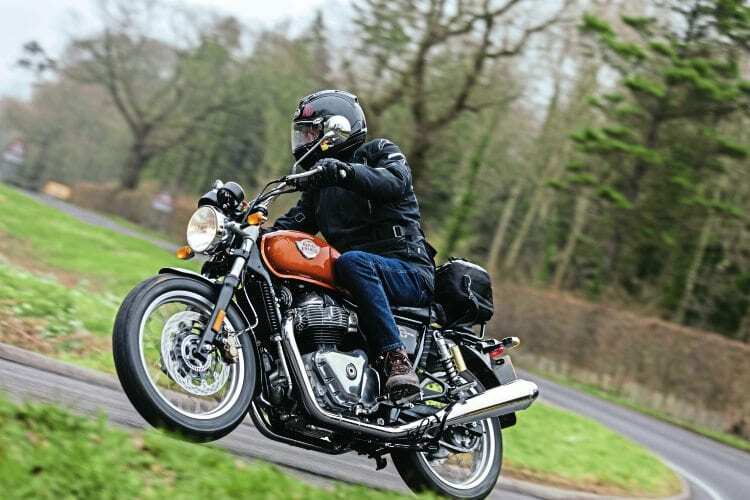 Sitting on the Interceptor, I was immediately enamoured by the sit-up-and-beg riding position and I could keep my feet flat on the ground at a standstill. Paddling it around to take pictures, I did wonder if it would be a little tall for those less than 5ft 8in or so. The seat is thin and without a frame modification or shortening the shock absorber height there’s not going to be any way of easily lowering the ride height by much. Finish is good, much better than the early prototypes, with nice thick paint on the tank and frame, braided hoses, alloy rims, and there’s a neat lockable panel for the tool kit.